This is the activity for everyone who wants an adrenalin kick! On our way to the White Water Jump we stop to try abseiling. This is a short, easy abseiling where the participants will get the feeling of wearing a harness, helmet and other safety equipment, and you also learn how to use it correctly. After the abseiling activity we will proceed to the location of the White water Jump. 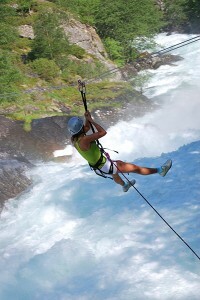 Here the instructor will secure you with ropes and carabines – and then you are ready to jump! The White Water Jump takes place in Øvre Eidfjord, meeting point is in front of the FlatEarth shop, and we advise you to meet us there there approx. 5 -10 minutes in advance.